Note: You need to know what we mean when we say “accurate” – that the measurement made gives a value close to the “real” value. Another term often misunderstood is "precision" which means if you make the same measurement over and over, you get the same value, but that value may not be accurate. Standards people prefer to talk about the “uncertainty” of the measurement because it’s practically impossible to know what the real value is, but it is possible to determine how much error is likely in any given measurement. With apologies to those people, I’m going to use the term accuracy because everyone uses it more commonly. The customer for a fiber optic cable installation will require documentation of test results before accepting and paying for the work. This obviously leads to certain but often conflicting requirements on the part of the contractor doing the installation. Testing takes time, so completing all the tests in the minimum time means more profit. Testing, however, needs to be done carefully to ensure the measurements are accurate1, and that can take time. Accurate testing, however, will ensure that no good cables are rejected and no bad ones missed, so the contractor will not have to repair what are really good cables and get callbacks on bad ones. Lots of time – and cost - can be saved if the contractor and installers know the proper measurements that need to be made, understands how to make those measurements correctly, has the proper tools, keeps them in good condition, has them calibrated regularly and knows how to use them efficiently. It is also the duty of the contractor to convey to the customer what is being done is in line with industry convention and standards. Learning the background and the issues concerned with making accurate measurements can save lots of problems – and money. Industry committees spend massive amounts of time and energy developing standards that ensure accurate testing. However, those standards are generally written for manufacturers, not users, so the task of translating “standardese” – the language they are written in – into understandable English is left to the manufacturers themselves and technical educators in articles like this. This tutorial will give you insight into what tests are required, what problems are inherent in testing multimode fiber, how measurement techniques differ and how to interpret the results of testing and document them. What Tests Are Available, Needed and Performed? All fibers in a cable plant should be tested at least for continuity, proper end to end connections and, most importantly, loss. How each of these tests are performed depends on the installation type, required standards and the actual layout of the components in the cable plant. Actually, there are five industry standard ways of testing the loss of a fiber optic cable – three for insertion loss and two for OTDRs – depending on how you use reference test cables for your setup. 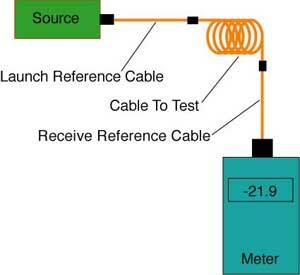 Insertion loss testing with a test source and power meter with reference cables (right) can use 1, 2 or 3 reference cables to set the “zero dB loss” reference for testing and each way gives a different loss. Generally standards prefer the 1 reference cable loss method, but it requires that the test equipment uses the same fiber optic connector types as the cables under test. If the cable has different connectors than the test equipment (e.g. LCs on the cable and SCs on the tester), it may be necessary to use a 2 or 3 cable reference, which will give a lower loss since connector loss is included in the reference and will be subtracted from the total loss measurement. Any of the three methods are acceptable, as long as the method is documented. Be careful, however, as most network link losses assume a 1 cable reference, which can affect the acceptance of the cable. OTDRs (Figure 2) always require a launch cable for the instrument to settle down after reflections from the high powered test pulse overloads the instrument. OTDRs have traditionally been used with long distance networks where only a launch cable is used, but this method does not measure the loss of the connector on the far end. Adding a cable at the far end allows measuring the loss of the entire cable, but negates the big advantage of the OTDR, that it makes measurements from only one end of the cable. First of all, to look at test requirements, we'll divide the topic by installation type: Outside Plant (OSP) or Premises. OSP cables are typically long distance singlemode cables that are installed in short sections, usually 5-12 km max depending on the cable size, since the bulk and weight of the cable determines how long is the longest cable that can be installed. Shorter lengths may be common in urban or campus networks, as cable is installed between junction points which are determined by the geography of the cable plant. Since shorter lengths of cable are spliced together, verification of the splices is important and is usually done with an OTDR test during the installation process. Once installation is complete, end-to-end insertion loss is done with a test source and optical power meter, sometimes called an OLTS (optical loss test set) and reference test cables. Certain ultra-long distance cables may require more complex testing for chromatic or polarization-mode dispersion. OTDRs depend on fiber backscatter for making measurements, so any difference in fiber backscatter at a splice will lead to higher loss in one direction and lower loss (or a gain) in the other direction. The only way to accurately measure splice loss is to measure in both directions and average, a tedious process in a long, large fiber count cable. One can get an idea of the magnitude of the uncertainty of the measurement by looking at the attenuation coefficient of the fiber on either side of the splice. It the two fibers are nearly equal, the directional variation will be small, but if they are large, big differences may be found. How Do You Test Premises Cables? In premises cabling systems designed for use with LAN backbones, fiber to the desk, CCTV, industrial control signals, etc., there are three tests that may be done, connection verification, insertion loss and OTDR. All cables should be tested for continuity with a visual fault locator or fiber tracer and the connections verified. In my experience, many fiber optic cabling problems are caused by poor documentation or confirmation of connections. 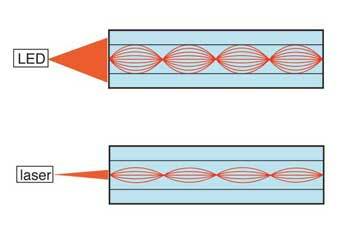 Since each link consists of two fibers, one fiber must connect a transmitter to a receiver and the other the complementary pair. Documentation and markings should all these connections to be made simply. This is easily confirmed with a visual light source coupled into the fiber. The measurement needed for confirming the quality of the installation is the optical loss or insertion loss of each of the fibers in the cable. Loss measurements are made end-to-end on the permanently installed cable plant, the equivalent of the UTP permanent link. Industry standards call for making that measurement with a test source and optical power meter, sometimes called an OLTS (optical loss test set) and reference test cables. Proposals have been made to also allow testing installed cable with just an optical time domain reflectometer (OTDR) but no accepted standard today requires this. TIA-568 (both the B version and the soon to be published C version) follows the industry convention, requiring insertion loss testing (called Tier 1 testing in TIA-568) and permits OTDR testing also (Tier 2) to provide additional information, but does not allow OTDR only testing in lieu of insertion loss testing. The use of OTDR testing of premises cable plants instead of insertion loss testing causes much confusion among contractors and customers. Hardly a week goes by that the FOA does not get a call regarding this issue. Misinterpretation of these requirements have led to some unhappy instances in our experience, including misreading OTDRs causing the removal and discarding of $100,000 worth of good cable and the retesting of 1100 cables of 12 fibers each, as well as several instances of customers returning OTDRs to distributors who sold them the units. Measuring a physical parameter always involves errors. Unfortunately you never know the real value you are trying to measure to begin with, so all you can do is to estimate the error based on the possible sources of error in making the measurement. There are two types of errors, random and systematic. Random errors are what you see when you make a measurement multiple times and get a slightly different value each time. Hook up your instrument and make the measurement, disconnect and try again. Each time, the result will be slightly different. Generally one should make several measurements, average them and use the data to calculate the random error, called standard deviation, to understand the uncertainty of the measurement. Random errors define precision. Systematic errors are how the average measurement differs from the real value, which can be caused by some problem in setup or calibration. Unfortunately, it’s hard to determine the systematic error, but some possible ways exist sometimes. We'll look at systematic errors first. Systematic errors are related to what we call accuracy. Why would all measurements be slightly different from the "real" value. Consider testing long lengths of singlemode fibers. The attenuation coefficient of the fiber is measured by the manufacturer at 1310 nm, but your test source may have a wavelength slightly different. If your source wavelength is shorter than 1310 (say 1290 nm, still within the limits of wavelength standards for laser sources,) all measurements of loss will be slightly higher than the manufacturer's tests. It may only be 0.02-0.03 dB/km, but over 25 km, that makes a difference of 0.5-0.75 dB loss. Likewise a test source at longer wavelength (say 1330 nm) will measure lower loss. In multimode fiber, LED test sources, which have wide spectral output, may have not only a different wavelength, but different spectral outputs. The measured loss will be an integration of all the wavelengths. Different LEDs will measure different losses, but the effect may not be large because most measurements are made on short cables. A bigger problem is the way the output of the LED fills the modes in the core of the multimode fiber, discussed below. For all measurements, systematic errors can be caused by testing with launch cables that have bad connectors, especially fibers not centered in the ferrule or are made with fibers with different core sizes (62.5 micron fiber cores can vary from about 60 to 65 microns.) Test this yourself, using a a light source and power meter and two cables of 50 and 62.5 micron cores. Test loss single-ended in one direction and then the other and note the enormous difference and how it is directional. The biggest and perhaps most common systematic error in testing comes from setting the reference power before testing. If a mistake is made during the reference process or the launch cable is removed and replaced on the test source, the changes in reference value will be reflected in every measurement. This is especially important when testing at two wavelengths, as references should always be set with the meter on the wavelength of measurement. Meters are calibrated at various wavelengths because of the wavelength sensitivity of their detectors. Changing the meter calibration setting can cause errors of several dB. Dirt can also cause systematic errors if the reference cables are dirty when the reference is set and cleaned afterwards during testing. If the dirt causes a big enough loss when the reference is set, it may even cause measurements to show a "gain" during tests - a real surprise for even experienced installers when they find "gainers" during insertion loss tests, thinking that happens only during OTDR testing. Random errors are errors that change with each measurement. Prove this yourself. Using a light source and power meter (set on 0.01 dB resolution) connected with a mating adapter and two patchcords tested single-ended. Mate and unmate the cables numerous times and note the different losses which can vary by tenths of a dB. These are random errors. If you can find a mating adapter with a plastic alignment sleeve, try that over 10-100 matings and watch how the loss reading go up. Look at the end of the connector and you see how dirty it gets from the plastic sleeve wearing against the connector. Speaking of dirt, that is one of the biggest causes of error. You should always clean both connectors when testing a cable. Between testing, keep dust caps on the connectors to prevent further contamination, but remember "dust caps" are often a source of dust, so clean the connector before each measurement. Unless all the connectors are carefully cleaned before each test, the condition of the end of the fiber can cause large random errors. Finally, all connectors wear with multiple insertions as the connectors end faces mate and wear the endface polish. Over the course of many measurements, the loss of reference cable connectors will increase slowly. The way to find this is to retest against each other periodically and replace when loss gets unacceptable. Experienced installers can repolish their connectors on diamond film like singlemode connectors, but it may be more cost effective to replace the cables. And always keep a set of spare reference cables in the field. All test methods have uncertainties when testing fiber optic cable. 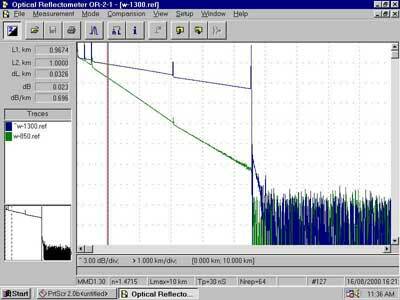 Making accurate loss measurements on fiber has been a constant and confusing subject of discussion within the standards committees, especially with respect to multimode fibers. We have tried to understand how light travels in multimode cable plants and how components like connectors affect how that light travels. Then we tried to understand how the losses of fiber, connectors and splices were affected by the methods used for testing. We're going to explain, hopefully in understandable terms, how this works, how it affects your measurements and how you can try to control test conditions to enhance your test accuracy. It’s going to take some careful reading on your part, but when we’re finished, you are going to be more knowledgeable, test faster and with less measurement uncertainty. As you can see, a laser couples light only into modes that travel near the center of the fiber while a LED couples light into practically all the modes. Look closely and you can see the modes near the center of the fiber core (lower-order modes) travel shorter paths than the modes near the edges of the core (higher order modes.) The shorter path of the lower-order modes means that they travel through less glass and suffer less loss than the ones traveling in the outside of the core. That means a laser suffers less attenuation (loss per unit length, in dB/km) in the same multimode fiber than a LED. Furthermore, as light travels down the fiber, the attenuation changes. The light in the outside modes is attenuated, leaving mostly light in the modes near the center. At a kilometer from a LED source, the light in the outer modes is mostly attenuated and the light carried in the fiber looks more like the light launched from a laser. This means the attenuation at that point is less than at the beginning because its only in lower order modes. So what is the loss of the fiber? The manufacturer’s spec for fiber is around 3 dB/km at 850 nm and 1 dB/km at 1300 nm. That is for a test using a calibrated source that is much closer to the launch of a laser source than a LED. The difference in the attenuation coefficient of a fiber tested with a laser or LED can be 1-2 dB/km. With a LED source, the first hundred meters of fiber – representative of a premises network – may have an attenuation of over 4 dB/km. The same factors hold for connector and spice loss. Most of the loss in connectors is due to misalignment of the two fibers and the higher order modes are much more likely to be lost at a connector than lower order modes. A connector coupled to a LED source with a short cable could have a loss of 0.5 dB while if it were coupled to a laser source or were 1 km away could have a loss of 0.3 dB. By now, I suspect your head is swimming. If you still have your wits about you, you may want to know how any standards body can solve this issue. The answer is how everything is solved – compromise. Create a standard launch condition that is more than a laser but less than a LED, which today is appropriate, since it’s more like the VCSELs (vertical cavity surface-emitting lasers) used in today’s Gigabit and faster multimode links. Manufacturers use special lensed sources in their labs that can control the launch conditions exactly. The way to approximate this launch for field testing is to use a LED source and a mode modifier, usually a few turns of the reference launch cable wrapped around a cylindrical mandrel that filters out the higher order modes. The mandrel size must chosen according to the fiber and cable type being used. (right, Table below) These devices are available from many test equipment manufacturers. It’s highly recommended that you use this standard source method, as it will produce more consistent test results and provide greater reproducibility better if you ever have to retest. And the losses measured are going to be lower so you are less likely to fail good cables. Even so, the uncertainty of the measurement is likely to be several tenths of a dB. The uncertainty comes from the coupling of your reference cables to the fiber under test, which includes the quality of the terminations on the reference cables, how clean they are and how many times they have been used, since they degrade with use. Below is the mandrel wrap specification from TIA 568, which is to be used with what is basically an overfilled (Category 1 CPR) LED source. NOTE – The mandrel diameters are based on nominal values of 20 mm (0.79 in) and 25 mm (0.98 in)) reduced by the cable diameter and rounded up. Here are two other more technical articles on modal distribution and control in MM fiber for testing. So Why Aren’t OTDRs Used? Some people think everybody uses OTDRs for all fiber optic testing, but that’s only true for outside plant (OSP) applications. Most OSP installations involve splicing singlemode fiber to get longer runs and the OTDR allows verifying the quality of the splice. But when that link is finished, it must still be tested for insertion loss with a light source, power meter and reference cables, just like premises cables. 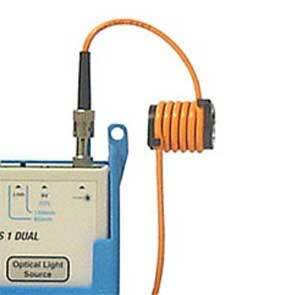 Premises cables rarely have splices and are short, often too short for the OTDR to measure. Insertion loss and OTDR testing use different methods. Insertion loss tests just like the fiber will be used, with a source on one end and a detector on the other, so tested insertion loss should be close to what the communications link actually will see. OTDRs, however, make an indirect measurement, based on fiber scattering, the major source of loss of a fiber. It sends a very powerful pulse down the fiber and some of the scattering comes back toward the instrument, where it is measured and stored. As the test pulse moves down the fiber (right), it takes a “snapshot” of the fiber illuminated by the test pulse from which information about the fiber may be implied. The second problem with OTDRs on multimode fiber is the laser source. As mentioned above, lasers couple light narrowly into multimode fiber and will measure lower attenuation and connector or splice loss than recommended by standards on the outward bound test pulse, but scattered light probably overfills the fiber, even more than a LED on the return. To date, we are unaware of anyone who has modeled this and can provide guidance on the expected test results from an OTDR. In addition, there are problems in premises applications with OTDR distance resolution. Light travels about 1 meter in 5 nanoseconds. The width of the test pulse is usually 10-30 ns and the minimum resolution of the OTDR is about 3 times that or 2-6 meters. Highly reflective events like multimode connectors in premises cabling, cause instrument overload and lengthen the minimum resolution of the instrument. Only a few specialized OTDRs have the resolution needed for premises cabling. OTDRs are complicated instruments. Before the OTDR is used to make a measurement, you have to set all these parameters correctly: range, wavelength, pulse width, number of averages, index of refraction of the fiber and the measurement method (usually 2 types for each measurement.) OTDR manufacturers should teach you how to set up the OTDR properly and how to interpret the rather complicated display. (left). But few customers are willing to invest the day or two necessary to learn how to use the instrument properly. So manufacturers create an “autotest” function like a Cat 6 certifier that tests the fiber and gives you a pass/fail result. Every debacle I have seen in OTDR testing resulted from inadequately trained personnel using autotest. Unfortunately, because of their indirect measurement technique, OTDRs do not easily correlate with insertion loss tests, and that’s why they are not allowed by industry standards to be use alone. Some users claim to have been able to control modal power in multimode fiber and get correlation between OTDRs and insertion loss tests, but results are hard to duplicate. The FOA did a comprehensive comparison test ourselves using special mode conditioners and were unable to get correlation. In fact, some of our tests gave divergent results between two different OTDRs! If one considers the OTDR test to be a “qualitative” not “quantitative” test, and one knows how to interpret the OTDR trace properly, one can determine if connectors and splices are properly installed and if any damage has been done to the cable during installation. If the user does not have the experience and knowledge to do a proper analysis, the device usually only causes problems. Before beginning the installation, the contractor should calculate a loss budget for each link based on the length of the link and the number of connections. This confirms the equipment will operate over that link. Then the expected loss will be known to allow a pass/fail decision by the person doing the testing. The contractor should have the proper test equipment and installers using the equipment should be familiar with its use. When terminating cables, each cable should be tested with a source and power meter using high quality reference cables. The accuracy of the measurements depends on having properly operating test equipment, high quality reference cables with a mandrel wrap, cleaning all connections before every measurement and using a consistent measurement technique. Reference cables should be tested with the same test equipment they are used with each day and cleaned carefully before each measurement. This also provides good practice to the installers using the equipment. All installers using the test equipment should be familiar with using the mandrel wrap on the launch cables. Since the light source and power meter insertion loss test requires an instrument at each end of the cable, two installers working together will speed up the process. A visual tracer can be used to identify the next fiber to test, making communication easier and cheaper than using cell phones. Data should be recorded in a spreadsheet alongside the loss budget calculation used for pass/fail criteria so the contractor and customer can verify the installation. Troubleshoot high loss links that fail testing by testing “single ended” with only a launch cable. Bad connections will show up as high loss when connected to the launch cable but not when connected directly to a power meter so reversing the cable test direction will usually find bad connectors.